Last week I attended the Washington URISA conference for the first time. Overall, I found the conference to be informative and useful and was impressed by the variety of sessions, particularly the volume and quality of open source presentations. I presented with David Howes and Gretchen Peterson on the Lone GIS Professional, a group that David started last year. It was an interesting session, in that about 1/2 the time was allotted to group discussion and David recorded audience input in real-time. 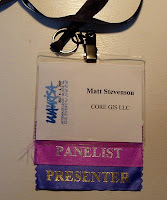 The objective of the talk was to spread the word about the Lone GIS Pro group, get more people involved, and perhaps more importantly, find out what would be helpful to Lone GIS people. It was surprising to me how many attendees of the conference are Lone GISers--either solo practitioners or the only GIS person at their business/agency/non-profit. The need for (and value of) a group like the Lone GIS Pro was reinforced in many of the sessions, based on their heavy emphasis on enterprise GIS systems with massive budgets, staff, and procedural requirements. It really is a differnet world when you're working on your own, and I'm grateful to have such an active, energetic and helpful group to turn to when I have a question or need some backup. If you are a Lone GIS professional and are interested in joining the group, please email me--the group is invitation-only. GIS analyst, conservationist, cyclist, sailor from Seattle.